Why our web hosting reseller program? PakHost reseller web hosting program can help you in offering professional hosting solutions to your customers. We take responsibility of creating private name servers for our reseller hosting clients so that your clients do not find that you are using PakHost.pk as your provider. Our plans meet needs of small to medium hosting companies as well as web developers who want to host websites of their customers by themselves. Since our web hosting reseller program provides you everything required for hosting company, that’s why you do not need to get into the hassles of server management and technical support because PakHost.pk does it all for you on just an email request. Our basic plan is an ideal plan to a startup hosting business which can be upgraded when required. 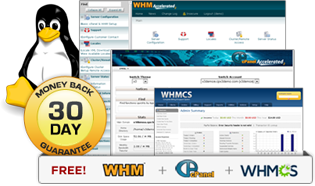 All our packages come with WHM which allows you to create cPanel for every customer with your desired hosting package. PkHost also offer 2 weeks money back guarantee with all packages. Order your web reseller hosting plan now. Enjoy our reliable 24X7 customer and technical support. You will get unlimited email accounts, unlimited FTP Accounts, unlimited Add-On Domains and Sub-Domains with our reseller website hosting plans. All our packages come with MySql, PHP / Perl.